The exhibit features fifty-million-year-old stone artworks from the Green River Formation in Wyoming, on display in Chelsea’s gallery district. Lithography is essentially printing with stone. 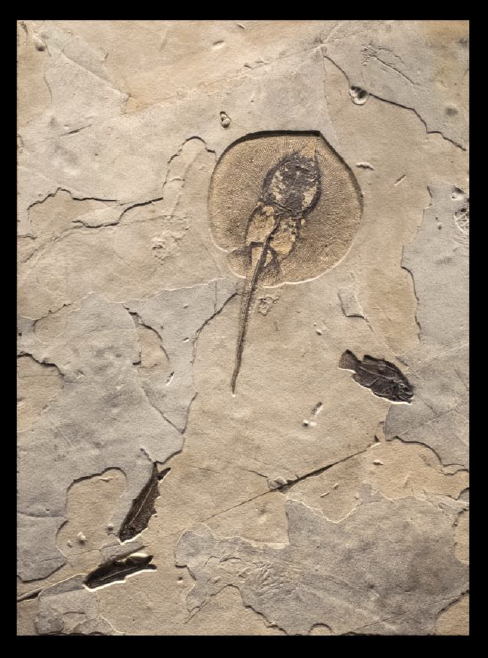 These fossils have imprinted themselves directly onto the very same limestone used in the earliest lithography. At the Wilensky Gallery, all of nature is viewed as one continuous evolving work of art. It is within this concept that ancient fossils are included in the conversation of the gallery’s revolving exhibitions. Opening on May 9th, and running through August 3rd, 2019, “Ancient Treasures: Fossils from The Eocene,” will feature twenty-five fossils meticulously removed and preserved by the Green River Stone Company, one of the world’s leading experts in fossil excavation and preservation. Long-forgotten creatures from Wyoming will appear as impressions in the Chelsea art gallery, similar in appearance to an etching or print, with fish or crocodiles pressed onto a stone. Prehistoric objects, such as fossils, have traditionally been reserved to the realm of science, natural history museums and deserts in remote parts of the world. The upcoming New York show will provide an opportunity for art buyers to add these extraordinary, natural art objects to personal collections, and will allow enthusiasts to view some of the rarest never before seen fossils originating in the United States. “When standing in front of these breathtaking works one quickly makes the transition from historical artifacts to a most powerful visual art form. Our clients naturally begin comparing elements of color, composition, texture, and beauty, the visual elements of great art. Beyond the physical beauty of these works, one is struck by the reality of their age and the passage of time. Not in the sense of days, weeks, or years as we are accustomed, but in tens of millions of years, the time required to transform living creatures into solid stone,” says Douglas Miller, a Partner at Green River Stone Company. 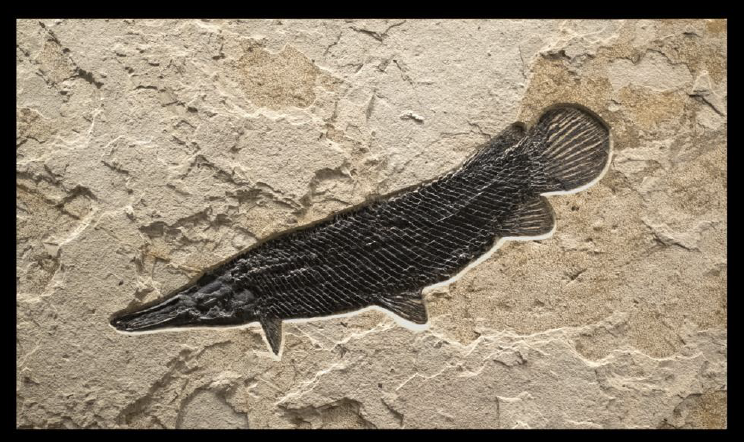 The exhibition will feature a variety of natural art murals, including a 50-million-year-old paddlefish, which was once thought to be the rarest fossil in the Green River Formation. Part of the reason Paddlefish fossils are so rare is that like their close relative, the sturgeon, their axial skeletons are composed largely of soft tissues that do not preserve in fossils. The particular specimen which will be displayed contains exceptional detail, with fine bones in the fin and tail regions, as well as the small stellate bones in the Rostrum, or bill. 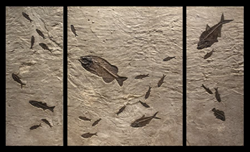 Another noteworthy showing is the Triptych Fish Mural, a three-part fish mural featuring a flowing composition of 26 fossil fish on a dark, highly figured, limestone matrix. The uplifting of the Rocky Mountains in the Tertiary period created the Green River Formation, with its diverse range of remarkably well-preserved faunal and floral fossils. In Southwestern Wyoming, fossil-rich calcium carbonate shale was deposited as sediment in a complex of freshwater lakes during the Eocene era around 50 million years ago. Green River is best known for its exquisite fish fossils, which were first discovered in this area during the 19th century. The excellent preservation is attributed to the great depth of the lakes and the anoxic conditions, which would have prevented scavengers from disturbing the dead fish, plants and reptiles. The Green River Stone Company has a private quarry in Wyoming, and a laboratory in northern Utah for preparing the fossils, and has been quarrying and preparing exquisite fossils for over twenty years. The company’s fossils can be seen in prominent natural history museums, and are frequently collected by architects, interior designers, and art connoisseurs. It produces one-of-a kind fossil specimens, wall murals, and sculpture, which are prized internationally. During “Ancient Treasures: Fossils from The Eocene,” the highly anticipated Green River Stone Crocodile will be on display. The crocodile “Borealosuchus wilsoni” measures 13’-5” feet long, and is wall mounted to support its 1,000-lb. weight. The crocodile is beautifully articulated, as if fossilized in midstride, which is rare for a large-bodied creature. They are more typically found with bones in a jumble, looking like a broken-up puzzle. The detail seen in this rare crocodile fossil is exceptional, including multiple sets of large and small teeth, perfectly arranged dorsal scutes, a protruding spine, and partially exposed ribs. In addition, a Stingray and Fish Mural will also be on display. Stingray fossils are uncommon, and among the most collected of all finned fossils from the Green River Formation, as well as fossilized gar fish, of which several will be on display. 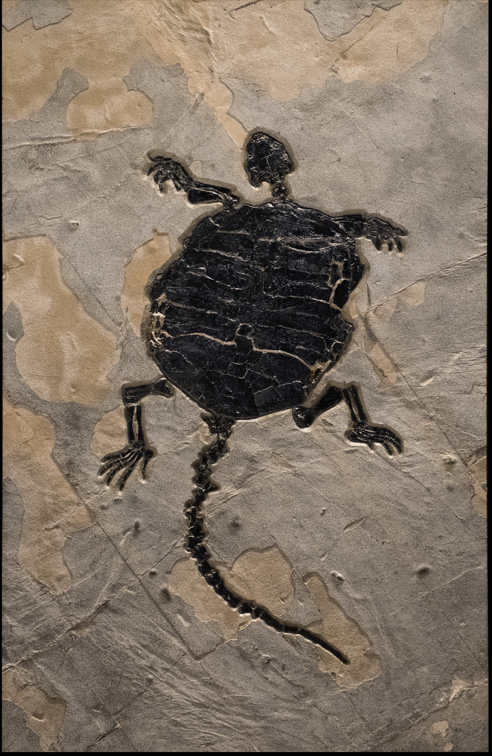 “Ancient Treasures: Fossils from The Eocene” runs from May 9th – August 3rd 2019, Monday through Saturday, from 11:00 AM-6:00 PM at the Wilensky Gallery at 173 10th Avenue, New York, NY, 10011. For questions regarding minerals or sales, contact the gallery directly at info(at)wilenskyminerals(dot)com, call 646-822-0837, or visit http://www.wilenskyminerals.com. For press inquiries, or questions regarding this release, contact Olga Gonzalez at Pietra PR at info(at)pietrapr(dot)com, or 212-913-9761. 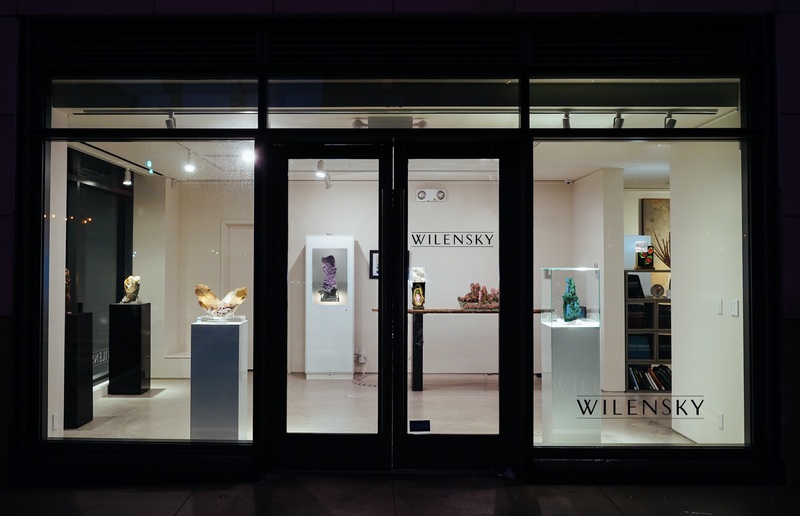 Wilensky Fine Minerals has entered a new chapter with the opening of a gallery in the Chelsea art district of NYC, presenting fine minerals among the world’s great art galleries, displaying minerals as works of art. The gallery opens up the amazing world of minerals to everyone. Minerals are displayed alongside neighbors exhibiting Warhol, Basquiat, Pollock and Picasso. Achieving the impact of art through natural mineral specimens is the goal. Not a competition, but a convergence. Internationally known for museum quality fossils and expert old-world craftsmanship, Green River Stone Company produces one-of-a-kind wall murals, tables, countertops, and tiles for customers. It is an American company dedicated to the creation of timeless works of art and design using fossil-rich limestone. The stone is harvested from Green River’s private quarry in Southwestern, Wyoming, then transported to fossil preparation labs in Logan, Utah, where each product is built by hand. Fossils are collected and prepared in adherence to strict guidelines established by the American Association of Paleontological Suppliers Code of Ethics, State and Federal Laws.